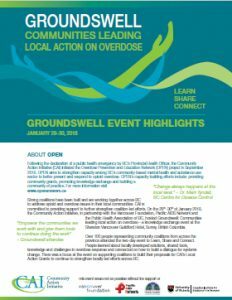 On January 29th and 30th, CAI partnered with Vancouver Foundation, Public Health Association of BC, Pacific Aids Network, and the Canadian Institute for Substance Use Research to host “Groundswell: Communities leading local action on overdose”. We are pleased to share the summary of what was learned and shared. Click the image below to view the full summary.